Pit Stop USA is The Online Motorsports Superstore! We feature Heat Mats & Screens at low everyday prices. Check out the Recently Listed Spark Plug Boot Protectors. Pit Stop USA is The Online Motorsports Superstore! 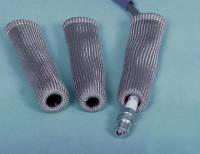 We feature Spark Plug Wire Protection at low everyday prices. Koolmat Insulation Mat - 12" x 15"
Koolmat Insulation Mat - 12" x 30"
Koolmat Insulation Mat - 24" x 30"
Pit Stop USA is The Online Motorsports Superstore! KoolMat is a space age material used in thousands of Commercial, Industrial and Automotive applications. KoolMat is a composite material of silicone cured to the surface and weave of a high temperature fiberglass substrate. Because the silicone attaches itself to the textile, there is no separation, and no flow of air or liquids through KoolMat. The silicone offers a great resistance to abrasion, radiant heat, gasses and oils. No matter what temperatures it is also an excellent sound deadening device. KoolMat is flexible and can be die cut to any shape or size and still perform like no other barrier. KoolMat is able to withstand 500A F of radiant heat and up to 2000A F with a ceramic backing. Used in 8O% of NASCAR and accepted by NHRA in October 1994. Every racecar needs a protective skin or liner installed on the floor to protect metal components from burning up and the driver from easy fatigue. 1ST THIS SKIN NEEDS TO BE BLOW-TORCH APPROVED what we mean by this is if it can take a 1000 degree F. torch test for 5 minutes it is perfect for the floor. With this test it can take a 500 lap race. This skin or liner should be installed immediately after the new paint has been added to the outside of the racecar. We suggest Koolmat Insulation and it should be laid down (riveted in place) before any other objects or holes are cut into the car. Koolsox is an impressive new double layered fiberglass sock designed to add extra protection to exposed spark plug boots and wires. Koolsox provides an easily visible way to detect potential burn areas before they occur. The sock absorbs the burn instead of the wire so no misfire occurs. An adjustable ring allows the unique sock to be rotated enhancing its longer life. Koolsox are soft, very flexible, easy to handle and install. Adapts and stretches over irregular surfaces. We feature KoolMat Insulation and Koolsox at low everyday prices!